To God be the Glory, God has done great and mighty things through Manna Ministries since 1966 (its inception) during the last fifty years. We humbly testify to the fact that it is not by might or power but by the Holy Spirit, the Lord has blessed and multiplied all the facets of the ministries. Fifty years ago the Lord laid a burden for the perishing souls upon the heart of Ernest Paul Komanapalli. With the vision of the Lord, Ernest and Rachel started Manna Ministries and the Lord gave increase through the 50 years. Christianity came to the south-central state of Andhra Pradesh through the ministry of various European and American missionaries. Two Indian men whose lives were changed during this move of God were Rev. K.S.Joseph and Rev. P.L.Paramjyoti. These two pioneers of the Pentecostal movement in the state of Andhra Pradesh suffered greatly for their devotion to the Lord and the Pentecostal truth. They were ostracized, beaten and left to one. They were near starvation numerous times, yet they remained faithful till their death and left a great legacy. The second son of Rev.K.S.Joseph and the eldest daughter of Rev. P. L. Paramjyoti, Ernest and Rachel would be united in marriage in 1963 after a prophetic promise that God would bring a great ministry out of their union. Previous to their marriage Ernest had completed Bible College at Southern Asia Bible College in Bangalore, India. Ernest's parents especially his mother Miriam encouraged Ernest to go to Bible College and serve the Lord. After graduation, he traveled through many villages and towns preaching the gospel of Jesus Christ. In 1961 through a series of miraculous events, Ernest attended the World Pentecostal Conference in Jerusalem. There he made contacts, which would eventually take him to the United States of America where he completed his Master's Degree in School Administration. Rachel, who was studying B.A. English Literature at the time of her marriage, completed her college studies at Andhra Christian College in Guntur, India and joined her husband in the USA in 1964. Ernest obtained a position as a special education teacher, and later became the Director of a community school in the Providence Public School system in Rhode Island. Rachel continued studying her Master's Degree in English literature. Upon completion of her certification requirements she was employed as a teacher in the Early Childhood Centre of Barrington College. When the first paycheck came, Ernest and Rachel knelt down in their tiny apartment and dedicated it to the Lord. They promised to support pastors in India with their tithes. From that small seed, Manna Ministries was born in January of 1966. Manna Ministries began with the counsel of Apostle P.L.Paramjyoti and Rev. K. S. Joseph by supporting two pastors. The headquarters was located in Amalapuram, in the East Godavari District of Andhra Pradesh State. As Ernest and Rachel made contacts with various churches and organizations, they were able to help even more pastors. In 1966 a literature arm of the ministry was started and the monthly magazine "Manna" in the Telugu language was released. In 1968 four literature centers were opened. The goal was to make available fine Christian literature in areas where it was impossible to obtain good devotional reading. "TO PREACH GOOD NEWS TO THE POOR"
Given this small beginning, Ernest and Rachel were content and had no intention of expanding their outreach further. However, the churches started to grow and more pastors were added to the ministry. We thank God for Bishop P.Spurgeon Raju, the President of Manna Full Gospel Ministries, a dedicated spiritual leader to supervise and work with the Pastors in all the districts and other states. He lives in Vijayawada which is centrally located to reach the churches anywhere in the country. Churches were planted in neighboring district and God was blessing in a mighty way. In 1971 the ministry had come to a point where a clear-cut strategy of church planting and direction was necessary. That same year, the Lord spoke to Ernest to return to his native land of India. In obedience to God, and the burning heart to serve the Lord, Ernest and Rachel returned to India to work full time in the field. Ernest became Senior Pastor of Manna Full Gospel Church in Amalapuram, which at the time had thirty members. Today the first church of their ministry has been blessed of the Lord with over 3,500 people worshipping there every Sunday morning. We thank God for the able leadership of Rev. Carl David Komanapalli, our Secretary and treasurer who provides extraordinary administration to many areas of the ministry while pastoring our largest Church at Amalapuram. By the year 1975, the ministry had spread to all the districts of the state of Andhra Pradesh and 250 churches had been established for the glory of God. In the later part of 1975, the doors opened to start works in the neighboring state of Odisha. Soon more doors started opening in other states, and today Manna Ministries has churches established in 23 states and 3 union territories in the nation of India. What started in 1966 with two pastors, The Lord has blessed abundantly. Today there are 1600 congregations in India and other countries. What began with only a handful of people has grown to a total membership of over 250,000 people. Praise the name of the Lord! Manna Ministries has adopted an organizational system that recognized the 5-fold ministry to body. A system of authority has been instituted at all levels providing for proper checks and balances. Bishop Ernest Komanapalli continues to inspire the leadership as Chairman Emeritus and Rev. Sudarshan Jyoti Komanapalli leads as Chairman. The highest authority is vested in the Executive Committee of the ministry, which consists of the Chairman, President, Vice-President, Secretary, Treasurer, and committee members. The various levels that have been developed range from grass roots all the way to the executive. The local church with its elders comes under the authority of the pastor. The pastor is accountable to area elders (who are also pastors). Over each district is an elder. The district elder is accountable to the Regional Vice-President who is accountable to the Executive. The leadership of Manna Ministries not only encourages, but also requires constant interaction between all churches and pastors. MIRIAM CHILDREN HOMES - "TO THE LEAST OF THESE ..."
Ernest and Rachel always shared the conviction in their hearts that the Gospel of Jesus Christ is not just in word but also in deed. This same conviction has been imparted to the pastors and leadership of Manna Ministries. The “cup of cold water" to the thirsty is as important as sharing salvation through Jesus Christ. The two need not be mutually exclusive. Ernest seen his own older sister die of malnutrition, and Rachel had seen her farther help many suffering in poverty. This changed their outlook forever. In 1968, Rachel went to visit a woman dying of cancer who asked that she take care of her children upon her death. Rachel promised, never expecting that the woman would die two days later. She took the two children into her home. It didn't take long for the word to spread. 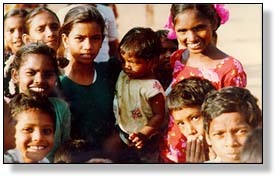 Within three months, twenty-five orphan children were staying in the Komanapalli home. Miriam Children's Home another ministry of Manna Ministries, was born. Today the ministry operates 40 orphanages: feeding, educating, giving shelter, and clothing to over 3,500 children. Since that small beginning, over seventeen thousand children have gone through these homes and on to being productive, successful and responsible citizens of India. Rachel in addition to raising her own children and six infant care children has become a true "mother in Israel". The "graduates" of the schools have found employment in many fields: professional and non-professional, industrial and service, Government and private sector. Many young men have been called into the ministry and currently pastor churches. All thank God for the chance they were given to make it in life through the ministry of Miriam Children's Home. Taking care of so many children brought many new concerns and responsibilities. Not only did the children require food and shelter, but what about their education? What about their future and job prospects? What about marriage? 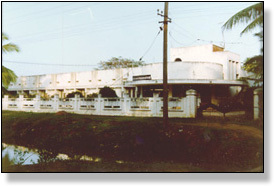 In 1972, Miriam primary school was started in Amalapuram. This was to be a school for primary education. The idea was to reach the younger children and then send them to government schools for the higher grades. However, it was determined that the government was unable to provide a satisfactory education for the children. As India is a developing country funds are limited to meet the needs of 1.3 billion people. It was decided to pursue a cradle to adult education policy for the orphanage children, as well as to provide quality education for the poor people of society and the Christian minority. Soon the primary school at Amalapuram was upgraded to a high school. Once that was done, schools were opened in the different areas where orphanages had been founded. Today there are 10 recognized schools being run. The system of education offers students the choice of either technical education or higher academic education following tenth grade. To offer training, and to provide the children with an opportunity to learn a trade, two industrial training institutes have been opened. In these institutes, students can be trained as electricians, fitters, mechanics, welders, diesel mechanics, printers, tailors, carpenters and secretaries. Many students have gone on to have successful careers upon completion of their studies. The opportunity for college education is small in India, and even smaller for the Christian minority and the poor of all backgrounds. To provide higher education, Paramjyothi Junior College and Miriam College have been established. Both are fully government university accredited institutions. Miriam College offers 12 major areas of study in the Bachelor Degree program. In the year 2000 Miriam College of Education, a teachers training college was started. Today hundreds of students experience the joy of learning to be a teacher and have an opportunity for a successful future. In 1971, Ernest Komanapalli became ill with cholera. In the town of Amalapuram medical facilities were terrible, so Ernest's brother in law, who was a doctor, was brought in to treat him. During this ordeal God spoke to Ernest about the thousands of people who have no one to treat them. With the burden laid upon his heart to build a hospital, the foundation for Rev.K.S.Joseph Memorial Hospital was birthed. On January 23, 1973, the hospital was opened and conducts rural health care camps and clinics throughout the area. It has truly become a blessing to many in the villages. The hospital was specialization and gained much recognition in the area of eye surgeries. The hospital conducts on a regular basis free eye camps in the rural areas. Surgery is performed for those who require it. Over the years, many well known doctors have come from all over the world and given of themselves to help many recover their sight, and surgeries as needed. During a Sunday service, a group of lepers entered into the church at Amalapuram, causing a great stir among the people. People started to get uncomfortable, not knowing what to do or how to react. The lepers sat through the service, and then came to the altar and accepted the Lord. They came back the following week bringing more lepers who also were saved. This happened for three weeks until communion Sunday. On that day, as was the custom, a common cup was passed. The cup came back to Pastor Ernest stained with the leper's marks. Ernest lifted the cup, but hesitated to partake of it. At that very moment, the Lord spoke to him saying, "This is the cup I drank from. Every sin was in that cup, every curse was in that cup, and every disease was in that cup, including leprosy". Something happened in Ernest's heart and the stained cup was no longer a cursed cup, but a blessed cup. Ernest drank from it. The Lord baptized the congregation with His love that day. From that experience was born New Life Center, a community and outreach for lepers. Fifty families now live in the community and many are treated each day for their disease. Much progress has been made to help them recover and join society again to lead normal lives. To plant churches and to reach into new areas, pastors and evangelists were needed. In order to train new men and women to serve God, Manna Bible Institute was started in 1972 at Amalapuram offering a 2-year basic ministry education in the Telugu Language, which later was shifted to Bhimavaram Church campus. Today there are Bible Institutes in Bhimavaram, Amalapuram, and Eluru. Manna Bible College at Hyderabad was started in 1981 to address the situation of multilingual India. It offers solid academic training (Bachelor's degree in Theology), as well as spiritual and practical training in the English language. When Rachel taught in Rock Academy in Virginia Beach, U.S.A., She used to sit in the play ground in her leisure hour and watch the school children play. During that time she used to sing in her heart the scriptures learned as a child. When she left for India Pastor Anne Gimenez prophesied that Rachel would write songs and lead people in song like Miriam of old. After returning to Amalapuram, Rachel prayed "Lord, birth new songs in our midst". Then suddenly one day a new song was birthed in her heart. With her husband's encouragement she encouraged others to write songs. Till today the Lord birth hundreds of songs in our churches that are great blessing in worship services Mr.K.V.Churchill, Mrs. Sharon Rose Komanapalli, Rachel J. Komanapalli and others have written many new songs that are used in many denominational churches and big crusades. In 1972, God opened the door to preach the gospel through radio. One of the programs is in the Telugu language. A weekly program was also aired in Oriya Language. Late Apostle P.L.Paramjyoti was the Radio speaker from the inception of our Radio Ministry. Later on Bishop P.Spurgeon Raju, Mrs. G. Sugnanam Joshua, Mrs. Esther Paramjyoti, Mrs. Rachel J. Komanapalli, Bishop M. Devadas. 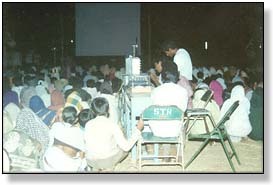 Film ministry is effective and popular method to reach the masses with the gospel of Jesus Christ. In 1979 a film ministry, Dayspring Enterprises of India was started in partnership with Rev. John Gilman and Dayspring International. For many years the outstanding movie on the life of Jesus "Karunamayudu" as well as other Christian film were shown with great results. In 1978, God spoke to Ernest to start a new work in the city of Hyderabad, the capital city of the state of Andhra Pradesh. Here a new center was to be established that would train men and women to reach out to all states of India. Along with the church and Bible College, a children's home for the deaf and dumb was founded. Another arm of Manna Ministries, Rock Church Ministries, was born. In the 1980's churches were established in the states of Madhya Pradesh, Manipur, Karnataka, Maharashtra and the Union Territory of Andaman Islands. Additional churches were raised up in Tamilnadu, Assam and Mizoram in the 1990's. The Lord spoke to the leadership of the ministry again in 1997, and what was thought to be only a vision for India, was enlarged. The Lord said that if Manna Ministries would bless those beyond its borders, then the Lord would bless within its borders. Under the leading of the Holy Spirit, Ernest traveled to Bhutan, Cambodia and Vietnam. For many years the ministry supported two pastors in the nation of Vietnam, contributed Bibles and helped a Church in China. To bolster evangelism through Multi Media another facet of Manna, Arunodoya Ministries was born. The publications department was created to publish books and other materials needed to reach the nation of India for Jesus Christ. Manna Magazine, which was originally printed in Telugu language, was also printed in Hindi and Oriya languages. The magazine has a wide circulation throughout India and abroad. The Lord helped us to publish books by well-known authors like John Bunyan's "Holy War", Demos Shakharian's "Happiest People on Earth", Dr. Fuchsia Pickett's several books, Dr. Sue Curran's and others. We thank God for Mrs. G.S. Joshua who was editor in chief for many years and her contribution to literature ministry. Today Manna magazine's chief editor is Rev. P. Deeven Kumar. In 1995 a television program, "Manna Madhuryam", was launched over satellite television. Bishop P. Spurgeon Raju was the TV speaker in the beginning years and since 1998, Rev. Sudarshan Jyoti Komanapalli has been the features speaker. We have aired on MAA TV, Gemini TV, Gemini Movies, Miracle Network and few other Christian channel that are viewed in several countries. We receive quite a large amount of mail from the viewers requesting for prayers and Gospel literature. Surprisingly most of the mail comes from the young people. We thank God for this channel to reach many with the Gospel of Jesus. Many souls are saved and many sick people are healed through this ministry. Massive public meeting and events have always been a favored and effective way to reach multitudes for Christ. Our many Gospel meetings and International Music Festivals have seen thousands upon thousands come to Christ. We are thankful for Rev. P. Deeven Kumar, President of Arunodaya Ministries who implements this vital work. In 1989 Manna Ministries International opened its offices in the United States as a facilitator for ministry in the USA. Since 1999 Manna International has broadened the scope of ministry from India to the World. In 1999, Sudarshan Jyoti Komanapalli traveled to South Africa. From that initial visit a wonderful relationship was born and we now have an affiliate work in South Africa with Zoe Global Ministries and our South African Representative Rev. Brian Dolan. Manna Bible College is actively training young people in Durban, South Africa. 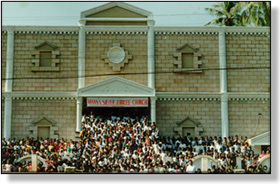 In 2003 the first missionary was sent from Manna Ministries in India to the country of Myanmar. Today other churches have also been established in the Middle East and Pastors are networked in other countries. In the early 1980's God laid a burden on the heart of Ernest Komanapalli concerning the unity of the Pentecostal, Charismatic and Full Gospel Churches. After much prayer and discussion with other leaders, the Full Gospel Leaders Fellowship of Andhra Pradesh was born. Manna Ministries was one of the founding members, and Ernest Komanapalli served as its first Chairman. And this body continues to bring together leaders of many organizations in fellowship. Manna Ministries is committed to unity at all levels and strives to encourage this wherever it can. To this extent, it was a founding member of the Pentecostal Fellowship of India, as well as many local pastor's fellowships in India. Ernest Komanapalli has served as first chairman at both the local and national levels. Manna Ministries believes that this unity must be worldwide if the world is to be reached for Jesus Christ. In so believing, it actively supports and is part of the Pentecostal World Fellowship. Ernest Komanapalli served on the advisory committee of Pentecostal World Conference for many years. He also participated in the dialogue between Catholics and Protestants organized a conference in Hyderabad for both Catholics and Protestants. Papal Pastor, Father Cantelamessa was the main speaker. The work of Manna Ministries has touched many lives in the nation of India and throughout the world. Hundreds of thousands have been touched and blessed spiritually, physically and materially through these years. There is no secret formula. For this success everything has been accomplished through an unwavering faith and commitment to the vision of proclaiming the Lordship of Jesus Christ over a dry and weary land. Added to this is the integrity of the leadership striving in every way to be obedient to the Lord's call. God has raised Ernest Komanapalli up as a true servant of God in these last days. The Lord has surrounded him with good men and women who have worked diligently and ministered the word of God day and night. Today, the solid leadership team he has developed under Rev. Sudarshan Jyoti Komanapalli sees to the continuity of the ministry every day. We are grateful to God for faithful men and women that have toiled in the vineyard of the Lord. In addition to those mentioned before, Bishop P. Peter, Bishop Elisha Raju, Bishop M. Devadas, Rev. K. Timothy, and all those who serve in leadership are to be remembered and commended. God has been faithful to provide in all circumstances, at all times. God through His people all over the world has provided resources when needed. We also are grateful for the able staffs in Hyderabad and Amalapuram who help to administrate the work. The children homes, educational institutes, health care, adult literacy programs, development works, housing and relief projects all stand as a testimonial to the love of Jesus in deed to a poor and needy nation. Over the years many individuals, churches and organizations from all over the world have generously supported these charitable efforts. We especially remember Erikshjalpen of Sweden, Evidence of Faith of Norway, The Christian Churches of North America, and many friends in Europe, Singapore, Australia and the USA. May God bless their sacrifice! Much has been done, much more need to be done. The Vision continues, and today the goal is to see churches planted throughout India and other countries, as God would lead. More Bible training centers will be opened so that more servants of God may be trained and sent out into the field. Multilingual programming for Radio and Television will be developed so that more people groups may be reached with the Gospel of Jesus Christ. Though at times the vision seems overwhelming, the goal remains the same " To win more souls and enrich more lives for Christ until Jesus returns.